The Colossus o Rhodes (Auncient Greek: ὁ Κολοσσὸς Ῥόδιος, translit. 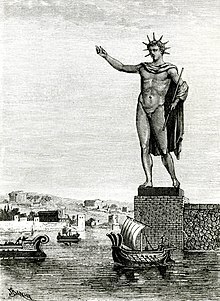 ho Kolossòs Rhódios) wis a statue o the Greek titan-god o the sun Helios, erectit in the ceety o Rhodes, on the Greek island o the same name, bi Chares o Lindos in 280 BC. ↑ Kolossos means "giant statue". R. S. P. Beekes haes suggestit a Pre-Greek proto-form *koloky- (Etymological Dictionary of Greek, Brill, 2009, p. 740). This page wis last eeditit on 18 Apryle 2016, at 20:54.